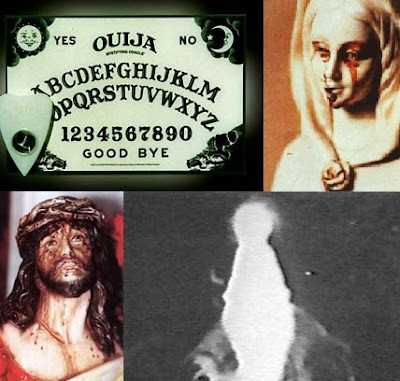 Interlocutor: Continuing with this issue of moving objects, Who are behind the so called “Ouija Board"? Johnakan Ur-El: Spiritual entities, from the planes 2 and 3... Entities of the planes 4 and 5 have nothing to do with that, because there are other better ways to Serve. Interlocutor: How could one take that kind of communication then? Johnakan Ur-El: That communication is very basic and it should be “taken with a grain of salt", as you say in the physical plane, because the answers are sometimes wrong on purpose. Johnakan Ur-El: No that’s all. Interlocutor: Perfectly. And what about the apparitions of the Virgin Mary, according to Christianity the mother of Jesus? Johnakan Ur-El: In some cases that entity who was the mother of Jesus can appear with the aspect it had in Galilee. In other cases they are false visions of people who take advantage of religious fanaticism of some believers. Johnakan Ur-El: That is false. That entity continues with us. It is in the plane 5 and it didn't embody. Interlocutor: And the tears that sometimes appear on the images that represent her? Johnakan Ur-El: They are tricks of entities of the planes 2 and 3. They have nothing to do with the mother of the Master or "miracles." Interlocutor: I’d like to take this opportunity to ask about what has been called "the bleeding walls". In a certain house stains of red color appeared on the walls, once they analyzed it they found that it was truly human blood. The strange thing is that this event happened in a closed place and there were no wounded people around of something like that. Johnakan Ur-El: This is also a trick of the spirits of the planes 2 and 3, these entities of error can dematerialize blood extracting it from a place and materialize it in the place where these stains can be seen by people they want to impress or scare. That is all, there is no enigma. Interlocutor: But, how do they do it? Johnakan Ur-El: Directly they make focus, they take out by means of transubstantiation some blood from a laboratory, they make focus once again and they put it in the plane 1 again where they want. That is all the mystery. Interlocutor: I have another question related to ghosts... What are they in fact? Johnakan Ur-El: Ghosts are simply spirits that simply appear with his last physical appearance... For instance, if a person with beard and 6 feet tall dies and a that entity is taken by a speaking medium as my vessel, a seeing medium will look toward that vessel and he will see superimposed to the body of the medium a person of 6 feet tall with beard, because the spirit will show his last face. Interlocutor: It is clear, but I didn’t mean to this kind of apparitions, but to the ghosts that wander in the castles and certain places, dragging chains and making strange noises. This entry was posted at Monday, August 03, 2009 and is filed under Mysteries and Enigmas . You can follow any responses to this entry through the .